The Potamoling is an industrial concrete-based lifeform. Based off of its appearance, it's most likely that the Borderling's a descendant of a Borderling from the Middle Ages. It resembles a gargoyle made out of concrete and pipes that are haphazardly melted in. It has a humanoid face with no mouth. Rusted yet polished copper pipes weave in and out of the Borderling's body. These pipes, despite their solidity, can move slowly and with a metallic grating sound. Between the joints of the Potamoling wings are cyan, glowing membranes made out of its own energy. Twisted cables sprout out of its tail ending with blocks in variable sizes. The Potamoling's hollow body is filled with a chunky yellow sludge, which acts similar to wet cement. This strange clay has 12,600 different types of minerals, most of them are not from this dimension. A musty, earthy smell emits from the sludge. A metallic, droning hum can be heard resonating from inside the Borderling's body. An impure Potamoling will have deformed and asymmetric proportions in its appearance. Its body sloughs in places and is incapable of holding itself together. The Potamoling appears in or around unfinished skyscrapers, underneath bridges, and around large dams and reservoirs. The Borderling emerges head first out of a puddle of yellow sludge that manifested in our dimension. Afterward, it finds the highest place to silently judge the world around it. The clay the Potamoling absorbs from petrified victims can also be used to create shrines in which it makes as temporary portals. It uses levitation to manipulate the strange substance into unique formations. Each of these Borderlings will make entryways that are unique in shape, size, and architecture. If one of these gates break, the Potamoling will soon build a new one. The Potamoling has a watchful disposition. It watches its territory through the highest place places in the city. The Borderling only moves from its place if it sees an unaffected human being. It doesn't flap its wings and will levitate 25ft (762cm) off the ground. When a person or Borderling becomes a victim of petrification, the Potamoling follow them unseen until they have succumbed to the transmutation. Whenever a statue is near empty, the Potamoling uses its tubes on its torso to fill the statue. Sometimes, it breaks arms and heads to let more clay flow from these hollow husks. The grossly yellow gunk is vital for the Potamoling's health. Using the needle on its chin, it absorbs the sludge. When supplies are low, the Borderling will become desperate. It moves from its spot and follows people from a safe distance, allowing its effect radius to petrify the unwary victims. Despite its flimsy body structure, the Borderling can endure hurricane winds. Water and frost, on the other hand, will slowly erode the Borderling unless it has enough clay inside its body to endure wear and tear. The Potamoling becomes impure when it doesn't farm enough clay to keep it healthy. 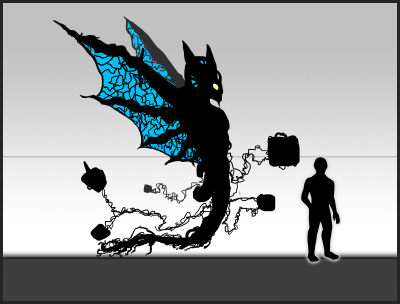 If it corrupted for long periods of time, the Borderling becomes immobile, like the statues it collects. If a pure Potamoling spots the corrupted Potamoling before its death, it will show signs of empathy and make a shrine for it to enter into the Externus. The other Potamoling will have no other choice than to accept the other individual's kind offer. After nourishment, it will recover and return back to full health. Witnesses who go within 36ft (1097.28cm) of the Potamoling's Effect Radius will have their entire body cavity slowly fill up with the same yellow clay as the Borderling's. Longer exposures will cause a person's body to become sluggish as their bones and muscles liquify and become like wet cement. The substance will start to excrete from their pores and other orifices. An hour and 40 minutes later, the victim will be petrified. The transmutation of construction workers around the Potamoling will soon result in a garden of human statues, mouths, and eyes wide open in shock and horror, dripping with yellow sludge. Concrete and granite will manifest in thin layers that will build up over time. The Potamoling's surroundings will be grainy from months of concrete buildup. Pipes will stop flowing and steel bars will be covered by the gunk. 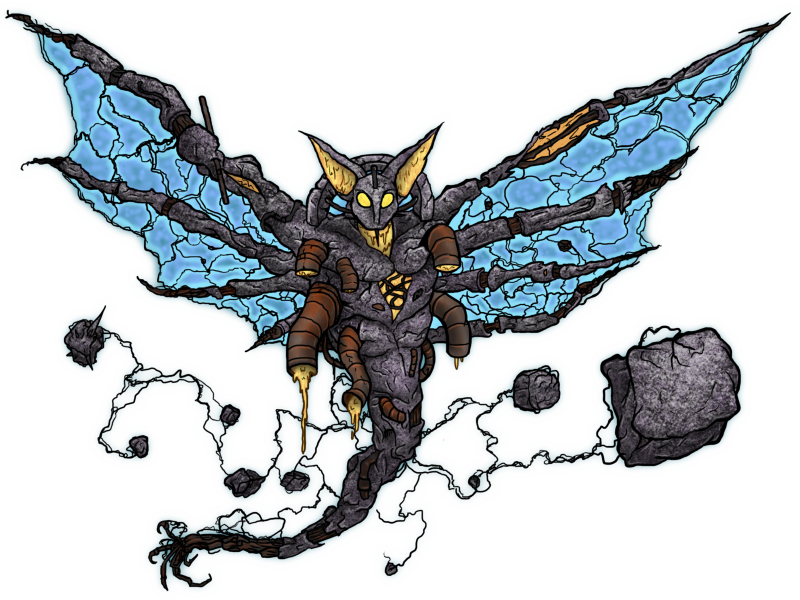 The petrification process will also affect Borderlings that have empty body cavities and openings around their body.